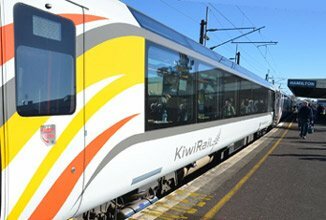 Whether you're an overseas visitor or a born-and-bred New Zealander, trains are the best way to travel between New Zealand's three main cities, Auckland, Wellington and (with a little help from the Interislander ferry) Christchurch. Trains are also the way to reach the North Island's Tongariro National Park, the South Island's west coast at Greymouth, the whale-watching and dolphin-swimming centre at Kaikoura or the Marlborough vineyards at Blenheim. See the route map opposite. Unlike domestic flights, the trains take you at ground level past superb scenery that can't be seen by road, in civilised comfort that cramped and uncivilised long-distance buses can't match. So ditch that short-haul flight and actually see New Zealand! 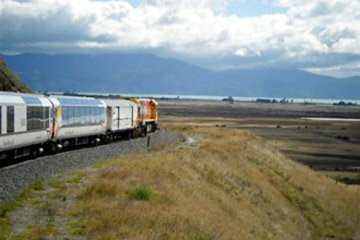 New Zealand's long-distance trains are operated by Kiwi Rail's passenger division, originally called Tranz Scenic but returned to public ownership in 2008 as KiwiRail Scenic and in 2017 rebranded yet again as Great Journeys of New Zealand. Who knows what it will be called next year? 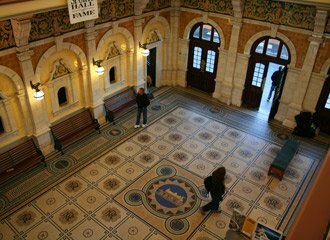 This page explains routes, train times, fares, the best way to buy tickets, and what there is to see on the journey. Click a route for info. Auckland suburban trains, at.govt.nz/bus-train-ferry. Wellington suburban trains, www.metlink.org.nz. This is an amazing journey, and one of my favourites, so ditch that domestic flight (or nightmare bus journey) and ride the Northern Explorer from downtown Auckland to city centre Wellington, stress-free and in comfort at ground level. Stop off if you like at the Tongariro National Park. This is an epic 681 kilometre (423 mile) journey right across the interior of the North Island, taking you in a single day past every kind of scenery there is, from coastline to volcanoes to mountains, from lush green farmland to thick New Zealand rainforest. It will take you the length of the historic North Island Main Trunk Railway, completed in 1908, over such feats of engineering at the Raurimu Spiral, Turangarere Horseshoe and Makatote Viaduct. It's one of the world's great railway journeys, yet is remarkably affordable! It's one of the most scenic ferry crossings in the world, and easily the best way to travel between New Zealand's North and South Islands - a genuine experience, not a mere flight. 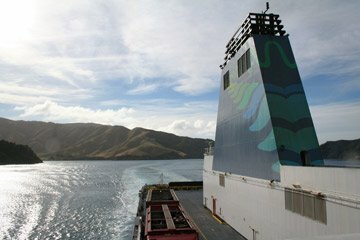 There are up to 5 daily sailings across the Cook Strait between Wellington and Picton, crossing time 3 hours. The 08:25 sailing from Wellington and 13:15 sailing from Picton connects with the Coastal Pacific train to/from Christchurch, see the Wellington-Christchurch timetable below. The Cook Strait has a reputation for choppy seas, but in reality only a third of the crossing is actually in the Strait itself, most of it is in very sheltered waters, and in my experience it was rock steady on the big, modern and stabilised ferry Kaitaki. Interislander sailings from Wellington: 08:45, 14:45, 17:00, 20:00. Interislander sailings from Picton: 06:55, 10:45, 13:45, 18:45, 22:00. Crossing time is 3 hours. Times vary by season, so check ferry fares & timetables for your date at www.greatjourneysofnz.co.nz/interislander. In Wellington, the Interislander terminal is a long walk north of the railway station, but a shuttle bus clearly marked Interislander leaves from platform 9 at the railway station 50 minutes before each sailing. The journey time is 5 minutes, the fare is NZ$2 per person, children under 5 free. Foot passengers must check in at the terminal at least 30 minutes before sailing time. All heavy baggage is checked in so only hand luggage is carried on board. Passengers connecting with the train to Christchurch can check in bags in Wellington all the way through to Christchurch. In Picton, the Interislander terminal is 200 metres from the station. All heavy baggage is checked in so only hand luggage needs to be carried on board. The 08:25 sailing from Wellington & 13:15 sailing from Picton connect with the Coastal Pacific train to/from Christchurch. You can book combined Wellington-Christchurch ferry & train tickets online at www.greatjourneysofnz.co.nz, but see the advice bee below to get the cheaper tickets. Both these sailings are normally operated by the Kaitaki, the largest ferry in New Zealand waters. The Kaitaki may look familiar to ferry travellers from Ireland or the UK. She started life in 1995 as the Isle of Innisfree on the Irish Ferries Holyhead-Dublin and Pembroke-Rosslare routes, and later the P&O's "Pride of Cherbourg" on the Portsmouth-Cherbourg route. 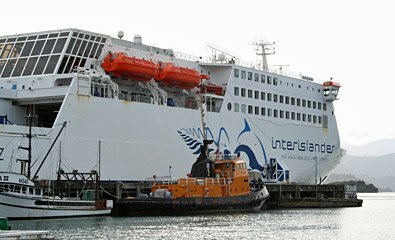 The Interislander ferry company was started in 1962 by New Zealand Railways, hence its close connections with the train service to Christchurch. Another ferry company also operates several daily ferries between Wellington and Picton, www.bluebridge.co.nz, but these ferries don't connect with the train to Christchurch. Kaitaki Plus first class lounge: For an extra NZ$45 paid on board, you can access the Kaitaki Plus lounge with quiet seating, power sockets, free WiFi, complimentary alcoholic and non-alcoholic drinks and a free light hot meal. Over-18s only. On the down side, the views from the lounge are slightly obstructed, and you may spend much of the crossing on deck, gazing at the scenery! The ship sails out of the Interislander terminal at Wellington and describes a wide arc out of Wellington harbour, with views of Wellington's seafront. It passes the suburb of Seatoun on the right and exits the harbour into the Cook strait separating the North and South Islands. Also on the right are some wicked-looking rocks, including the Barrett Reef where the Lyttelton-Wellington overnight ferry m/v Wahine came to grief in a storm in 1968. The crossing of the Cook Strait itself only lasts an hour, and at the other side the ferry passes between narrow headlands into the Tory Channel. Named after the "Tory", a migrant ship which passed through the channel in 1840, the Tory Channel is one of the Marlborough Sounds, a narrow channel between Arapawa Island on the right and a strip of mainland on the left. The ship slowly follows this channel, through an 's' bend, entering the larger Queen Charlotte Sound and finally arriving at Picton, a small town and the railhead for the South island. The Interislander ferry Kaitaki at Wellington. 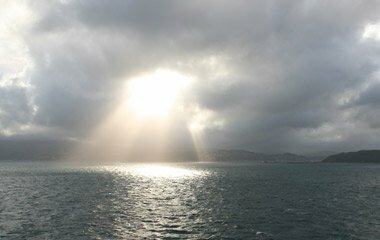 The sun bursts through the clouds out in the Cook Strait. The Interislander ferry Kaitaki in the Tory Channel. Another shot of the ferry in the Tory Channel. The ferry arrives at Picton. 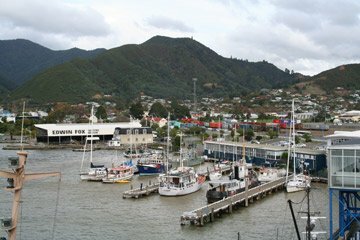 The Edwin Fox museum ship can be seen, with Picton station a red-roofed cream building just above and to the right. The Interislander ferry Kaitaki at Picton. The Interislander ferry and connecting Coastal Pacific train are easily the most comfortable and scenic way to travel from Wellington to Christchurch. It's also very cheap, with inclusive train+ferry fares from just NZ$139. 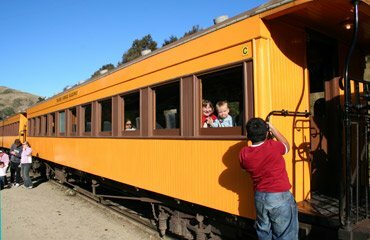 Named TranzCoastal until 2011, the train has now regained its original name Coastal Pacific. TRAIN RESUMED RUNNING ON 1 DECEMBER 2018. This lovely coastal route was badly damaged and put out of action by the earthquake in November 2016 for two years. However I'm glad to say it resumed running on 1 December 2018. * = Runs daily from late September until late April, for exact dates see www.greatjourneysofnz.co.nz. The Coast Pacific used to run daily all year but was reduced to running in the New Zealand summer season only. It was planned to restore all-year-round running, but this clearly hasn't happened in 2019 after all. One class of seating, cafe-bar, open-air viewing platform. There are other Wellington-Picton Interislander ferry sailings, see www.greatjourneysofnz.co.nz/interislander, only the rail-connected sailing is shown here. It leaves Wellington at 08:45 on some dates, and northbound times vary too, so always check for your date of travel. * Starter fare = limited availability, non-refundable, changeable until 24 hours before departure if you pay any difference in fare. These cheap fares disappear from the Great Journeys of New Zealand website when it is viewed from a computer outside NZ, so either use the Tor Browser workaround explained below or buy by phone! Children aged 2-14 travel at reduced fare, Infants under 2 travel free. 2. 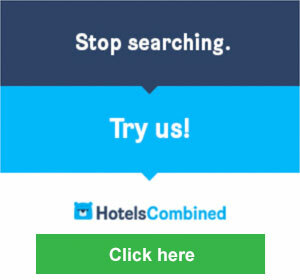 What you see if you book with the Chrome Hola! extension installed and switched to New Zealand, as explained below. Much cheaper prices magically appear! (3) Now go to www.greatjourneysofnz.co.nz and book your journey, and be amazed at how cheaper prices magically appear that weren't there when you browsed normally! Or buy via an international phone call instead: If you're not sufficiently computer-savvy, you can buy all the cheap prices if you call New Zealand. Call Great Journeys of New Zealand telesales on + 64 4 495 0775, as all fares are available by phone, potentially saving money even allowing for the cost the call. From outside New Zealand, call Kiwi Rail on + 64 4 495 0775, remembering that NZ is 13 hours ahead of the UK in the UK's winter, 11 hours in summer - you should be able to buy the full range of fares including Webstarter and Starter fares, although recently people have said staff have been funny about selling the full fare range if they know you're not in NZ. When you're in NZ, call them on their free-phone number, 0800 TRAINS (0800 872 467). Insist on a Starter or Webstarter or abort and book online as above! Alternatively, if you live in the UK or Ireland you can arrange New Zealand train tickets or passes & reservations with UK-based train travel specialist International Rail, call 0844 248 248 3. From outside the UK +44 844 248 248 3. Lines open 09:00-17:00 Monday-Friday. New AK coaches were introduced on this train in 2011, featuring massive picture windows and roof skylights, very similar to Switzerland's famous Glacier Express. Cafe-bar: The Coastal Pacific has a cafe bar serving snacks, drinks, tea, coffee, wine, beer, spirits and light microwaveable meals, at reasonable prices. I can recommend the breakfast roll in the morning (NZ$7.50) and the Devonshire cream tea in the afternoon (NZ$6). Open-air viewing platform: There is a full-length open air viewing platform, ideal for photographers or just watching the scenery. It's usually at the north (Picton) end of the train. New Premium class... At some point, a new Premium class carriage will be added to the train, with extra-legroom extra-width reclining seats arranged 2+1 across the car width (the usual cars have seats 2+2 across the car). Details will follow when known. The Coastal Pacific in the hills south of Blenheim, a photo taken from the open-air viewing car (taken before the train was re-equipped with the new AK carriages). 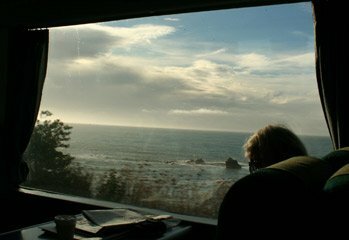 ...the train passes 98 km of wild misty coastline. You can spot seals from your seat! Taken from the open-air viewing car. This photo shows new 'AK' cars. Courtesy of Ivor Morgan. Shuttle bus for ferry departures and arrivals at Wellington: The Interislander terminal is a long walk north of Wellington city centre, but a shuttle bus (clearly marked 'Interislander') operates from platform 9 at the railway station 50 minutes before each ferry leaves. The journey time is 5 minutes, the fare is NZ$2 per person, children under 5 free. Tickets can be bought with cash or credit card from the ticketing station. Similarly, a shuttle bus meets each ferry arrival and will take you to the railway station as soon as everyone has reclaimed their baggage (although there's no shuttle bus for ferry arrivals after 9pm). Check-in & baggage: You must check in to the Wellington Interislander ferry terminal at least 30 minutes before departure. At the ferry terminal, all bags except hand baggage must be checked in. If you're connecting with the Coastal Pacific train, you can check your bags all the way through to Christchurch. Similarly, when checking in at Christchurch, you can check your bags all the way through to Wellington Interislander ferry terminal. Your bags will automatically be transferred between ferry and train at Picton, and you reclaim them at your final destination, either Wellington or Christchurch. Make a seating request: If you book by phone (or book online and then call Kiwi Rail's freephone number when you get to NZ at least the day before travel, quoting your booking reference) you can make a seating request. The obvious request to make is for seats on the left-hand side of the train going south from Picton, or the right-hand side coming north from Christchurch, as this puts you on the coastal side of the train where most of the scenery is. Keen photographers could also request seats at the northern (Picton) end of the train close to the viewing platform. Requests can't be guaranteed, of course, but it doesn't hurt to ask! The 3 hour, 92km crossing of the Cook Strait is one of the most scenic ferry rides in the world. You sail in a wide arc out of Wellington harbour and across the open sea of the Cook strait itself, before passing between headlands into the Tory Channel, named after the migrant ship 'Tory' which navigated the channel in 1840. 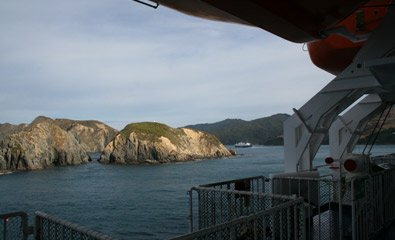 The ship follows this narrow channel between the island of Arapawa and the mainland, all the way to Picton at the head of Queen Charlotte Sound. At Picton, the station is just a 200 metre walk straight ahead of you. Look out for the 'Edwin Fox', a preserved 19th century sailing ship in a museum on the left. It's the ninth oldest wooden sailing ship in the world, and you can see it from the road even if you don't have time to go in to the museum. At the station, the small wooden station building now houses a 'Subway' fast food place, a travel agency, and a small check-in desk for the train. Seats on the train are allocated there. The train leaves Picton station and curves around valley out of the town. Within half an hour you're in the middle of vineyards in the Marlborough wine region. You'll pass one of the main Montana wineries, with its huge stainless steel tanks. The train calls at Blenheim, the region's main town. Soon after Blenheim, the train climbs hard up a long gentle pass through grassy hills. Within an hour of leaving Picton, snow-capped mountains appear in the distance on your right, and you pass over what used to be a double-decker combined road and rail bridge over the Awatere river, with the railway on top and roadway underneath. The road deck has been removed now that a separate road bridge has been built. Just over an hour from Picton you skirt Lake Grassmere. Salt is produced here, by letting sea water evaporate in large salt pans. You'll see piles of harvested salt on the right. About an hour and a half after leaving Picton the train reaches the sea. It now runs right along the coastline for about 98 km. You'll see beaches, cliffs, rocky headlands, in places draped with low-lying sea mist. Although parts of the line are much older, the Picton-Christchurch railway was only completed in 1945, although work on this coastal section started in the 1930s. Until then, overnight ferries had linked Lyttelton (the port of Christchurch) direct with Wellington. 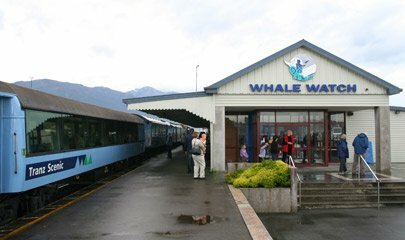 The train stops at Kaikoura, the South Island's main whale-watching and dolphin-swimming centre. The whale-watching centre is now housed in the old station building. the train stops for several minutes here and you can get out and stretch your legs. The train continues along the coast. Watch out for the seal colonies just feet from the train. 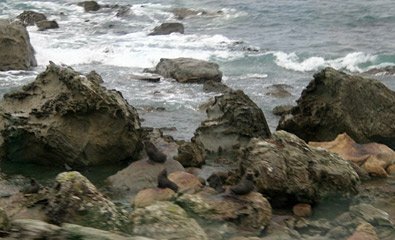 the seals tend to be the same colour as the rocks, but with a bit of practice you can spot huge numbers of them! Just over 3 hours from Picton, the train swings inland again, through green hills and pretty valleys. The train passes through the Christchurch suburbs and arrives at Christchurch station. This is now a small modern single-platform rail terminal, opened in 1993 in an unremarkable industrial estate built on what was once the massive Addington Railway Works. Much of New Zealand Railways' locomotives and rolling stock were once built there, although there's little left to show for it..! The new station is some 3km from the city centre, but taxis and shuttles (shared minibus taxis) are available. Until the recent earthquake, Christchurch's original station (well, the building opened in 1960 though built to a design first published in 1938) still stood on Moorhouse Avenue to the south of the city centre where it had become the 'Science Alive' entertainment centre. The TranzAlpine is the most scenic train journey in New Zealand, and one of the most scenic train trips in the world. Not surprisingly, it's become the most successful of all the Kiwi Rail Great Journeys passenger train services, very popular with tour groups because of the spectacular crossing of the Southern Alps between Christchurch and the South Island's west coast at Greymouth. It's a fantastic trip, though in my opinion neither as epic or as historically-significant as the Auckland-Wellington Northern Explorer. 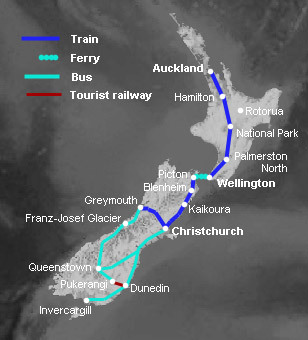 Once important cities, Dunedin and Invercargill have declined in importance and apparently no longer justify a proper train service to the rest of New Zealand. The last Christchurch-Dunedin-Invercargill train service, the daily "Southerner" over the South island's Main South Line, was withdrawn in 2004. Nowadays, anyone wishing to reach these towns must endure a long bus journey from Christchurch. Here are the main bus services, although an additional bus may run on Fridays and Sundays. Please check times before travelling at the bus operator websites, www.intercity.co.nz. Christchurch-Dunedin costs NZ$33-$46. 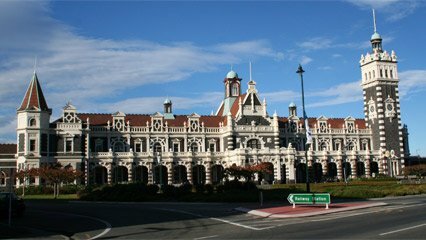 Christchurch-Invercargill costs NZ$35-$67. 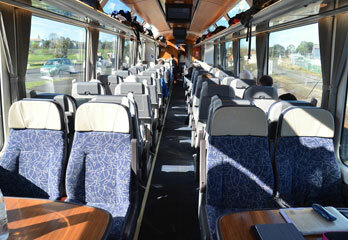 You can check fares and book bus tickets online at www.intercity.co.nz. There were never any train services to Queenstown, although historically you might have taken a slow train from Invercargill to Kingston (the preserved Kingston Flyer train uses part of this route), then a steamer across Lake Wakatipu to Queenstown, a route on which Queenstown's famous 100-year old working steamship Earnslaw would have worked. Today, there are bus services operated by several companies. You need to change buses and overnight in Queenstown if you are travelling to/from Milford Sound. You can check times, fares and book bus tickets online at www.intercity.co.nz, www.newmanscoach.co.nz & www.toplinetours.co.nz. 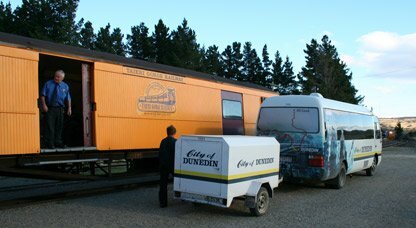 The most rewarding way to travel between Dunedin and Queenstown was via the Taieri Gorge Railway's Track & Trail train/bus link, but sadly they no longer offer this train-bus combo (perhaps you could arrange a private transfer between Pukerangi & Queenstown using a Queenstown taxi service?). 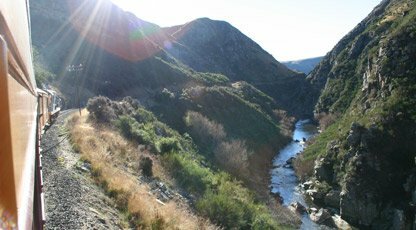 However, you can still ride the Taieri Gorge Railway (www.taieri.co.nz), a preserved railway running daily year-round tourist trains through spectacular scenery over part of the old Dunedin-Cromwell branch railway. Leaving from the beautiful and much-photographed 1906 railway station in Dunedin's town centre, it travels a few kilometres south over the South Island Main Trunk Line (still well-used for freight but sadly with no passenger service) before branching off inland through the scenic gorge that gives the line its name. The train terminates at Pukerangi, 58 km from Dunedin, extended to Middlemarch on summer Fridays & Sundays, 76 km from Dunedin. Highly recommended! 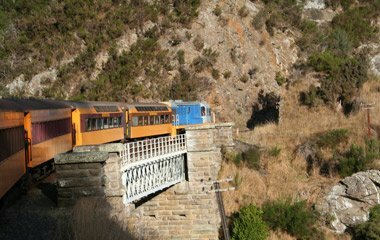 The Taieri Gorge Railway now also operates a tourist train called the Seasider along the main line between Dunedin and Palmerston. * = The railway no longer offers an integrated bus connection. 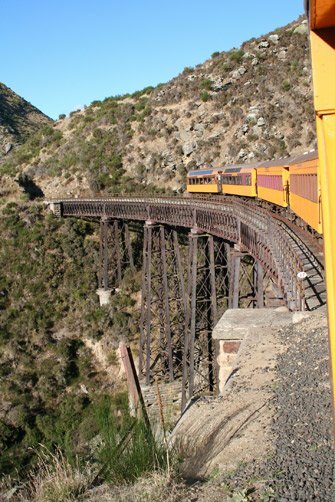 To check times, fares & buy tickets, contact the Taieri Gorge Railway on www.taieri.co.nz or call (03) 477 4449. Above right, the connecting bus meets the train and takes Track & Trail passengers to Queenstown. Sadly this no longer operates. New Zealand Scenic Railpass: Buy online at www.kiwirailscenic.co.nz/scenic-rail-pass.. 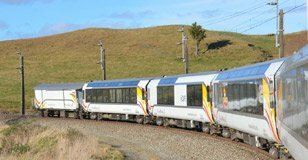 There is an excellent New Zealand Railpass giving unlimited travel on all Kiwi Rail's Great Journeys of New Zealand trains and the Inter-Island Ferry between Wellington and Picton. 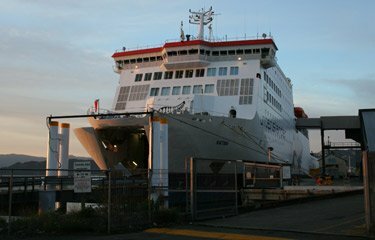 If you're going to travel on all 3 trains from Auckland to Wellington, across on the ferry and down to Christchurch and on to Greymouth, the 7-day pass will save money and give flexibility. In Auckland, the Airedale Hotel or Mercure Auckland Hotel are both sound central choices, the latter right near the Britomart station and Devonport ferry terminal, though not the cheapest options. In Wellington, the Shepherds Arms Hotel is a cosy gastro pub just 15 minutes walk from Parliament and the city centre with friendly staff, great food and good beer. A top choice! www.tripadvisor.com is a good place to find independent travellers' reviews of the main hotels, and it has the low-down on destination sights & attractions, too. www.hostelworld.com: If you're on a tight budget, don't forget about backpacker hostels. Hostelworld offers online booking of cheap private rooms or dorm beds in backpacker hostels in many places in New Zealand at rock-bottom prices. Overland travel by train & bus around New Zealand is an essential part of the experience, so once there, don't cheat and fly, stay on the ground! But a long-haul flight might be unavoidable to reach New Zealand in the first place.